93 urte zituela hil da Salt Lake City, Utah-n.
Berak harro esaten zion "beutiful Gernika"tik, Estatu Batuetako Utah-ra emigratua, bere senar Jaime Sangronizekin euskal familia indartsu eta errotu bat sortu zuen Salt Lake Cityn, euskara eta euskal kultura oinarrizko osagai izan dituena, seme-alabetan eta biloben beunaldira ere hazia zinez transmitituta. Iaz hil zen Jaime, eta orain joan zaigu Madalena. Biak erreferenteak Utahko euskal komunitatean azkeneko hirurogei urteetan, Euskal Etxeko sortzaile eta zutabe. Lerro hauetatik, gure dolumin zintzoa eta besarkada handia seme-alaba Leon (Katherine Dennett), Pilar (Jay Shortsleeve), James (Cathy Doherty) eta Cristina-ri (Curtis Padjen); bilobei, Cirbie (Amanda), Antonia, Patxi, Andoni, Mikel eta Amaia-ri; Euskal Herriko ahaideei eta nonnahi ugari zeuzkan lagunei. Born January 25, 1925 in Gernika, Bizcaya, Spain the 3rd of 5 children of Manuel Zatika and Antonia St. Ines. She died September 27, 2018. Survived by her sister Dolores Zatika, four children: Leon (Katherine Dennett), Pilar (Jay Shortsleeve), James (Cathy Doherty) and Cristina (Curtis Padjen) and 6 grandchildren, Cirbie (Amanda), Antonia, Patxi, Andoni, Mikel and Amaia. At age 12, she survived the German bombing and destruction of her home in the ancient Basque capital of Guernica during the Spanish Civil war that ominously foreshadowed the beginnings of WWII. She was training as a chef at the Kataro Restaurant. Later she was recruited by the town doctors to study nursing and gained a reputation as the most caring nurse. At age 28 she said yes to and married her childhood friend and life-long companion Jamie Sangroniz. He would take her far from home, to the United States, where they settled in Bingham Canyon, Utah to begin their lives together. There they made strong connections with other Basques families in the area. They later moved to Midvale City. Together they raised their four children in a warm and welcoming house that her husband built but that she made into a home. When her children matured she resumed caring for others as an LPN in several valley nursing homes. The home was her domain, especially the kitchen. She loved cooking for everyone and sharing her recipes. Magdalena was a founding member of the Basque Club of Utah and organized the Basque Choir for the annual picnic. 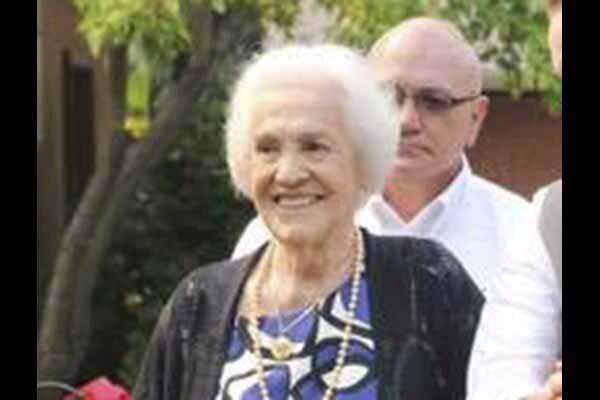 At the age of 93 she quietly passed surrounded by her family. The family would like to thank Angela, Joanie, Ed, and the Home Health team at Signature Home Health for their care and compassion. Funeral Mass will be Friday, October 5, at 11 a.m. at St. Therese Catholic Church, 624 W. Lennox St., Midvale. Holy Rosary will be recited Thursday at 7:30 p.m. at Goff Mortuary, 8090 S. State St., Midvale with visitation from 6-7:30 p.m. Interment, Larkin Sunset Gardens.